The two most common types of surgical drains that I have dealt with are Jackson-Pratt (JP) drains, accordian drains, and wound vacuums (commonly called wound vacs). These three drains are all set up to some form of suction. The JP and accordian drains have suction generated by compressing the drainage container while the wound vac is hooked up to a suction container with continuous settings. I started writing a page about surgical drains, but why rewrite something that was already so eloquently written? A medical website for patients had this article which very concisely goes through the purpose of drains, the types, and removal of them. "Surgical drains of various types have been used, with the best intentions, in different operations for many years. It is often open to question whether they achieve their intended purpose despite many years of surgery. There is a paucity of evidence for the benefit of many types of surgical drainage and many surgeons still 'follow their usual practice'. With better evidence, management of surgical patients should improve and surgeons should be able to practice based upon sound scientific principles rather than simply 'doing what I always do'. Lack of definitive evidence has not helped the resolution of some controversial issues surrounding the use of surgical drainage. To prevent the accumulation of fluid (blood, pus and infected fluids). To prevent accumulation of air (dead space). To characterise fluid (for example, early identification of anastomotic leakage). Orthopaedic procedures (associated with greater blood loss). Infected cysts (to drain pus). Management is governed by the type, purpose and location of the drain. It is usual for the surgeon's preferences and instructions to be followed. A written protocol can help staff on the ward with the aftercare of surgical drains. Open drains (Including corrugated rubber or plastic sheets) drain fluid on to a gauze pad or into a stoma bag. They are likely to increase the risk of infection. Closed drains are formed by tubes draining into a bag or bottle. Examples include chest, abdominal and orthopaedic drains. Generally, the risk of infection is reduced. Active drains are maintained under suction (which may be low or high pressure). Passive drains have no suction and work according to the differential pressure between body cavities and the exterior. Silastic drains are relatively inert and induce minimal tissue reaction. Red rubber drains can induce an intense tissue reaction, sometimes allowing a tract to form (this may be considered useful - for example, with biliary T-tubes). If active, the drain can be attached to a suction source (and set at a prescribed pressure). Ensure the drain is secured (dislodgement is likely to occur when transferring patients after anaesthesia). Dislodgement can increase the risk of infection and irritation to the surrounding skin. Accurately measure and record drainage output. Monitor changes in character or volume of fluid. Identify any complications resulting in leaking fluid (particularly, for example, bile or pancreatic secretions) or blood. 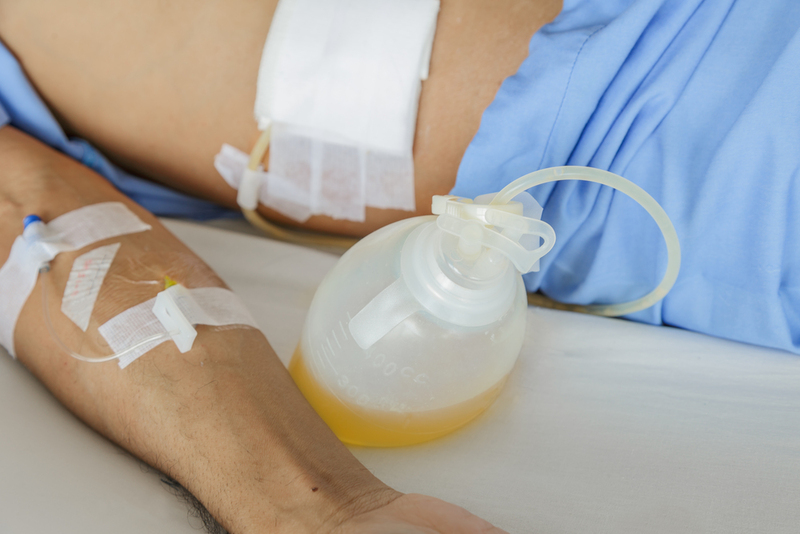 Use measurements of fluid loss to assist intravenous replacement of fluids." Generally, drains should be removed once the drainage has stopped or becomes less than about 25 ml/day. Drains can be 'shortened' by withdrawing them gradually (typically by 2 cm per day) and so, in theory, allowing the site to heal gradually. Usually drains that protect postoperative sites from leakage form a tract and are kept in place longer (usually for about a week). Warn the patient that there may be some discomfort when the drain is pulled out. Consider the need for pain relief prior to removal. Place a dry dressing over the site where the drain was removed. Some drainage from the site commonly occurs until the wound heals. Drains left in place for prolonged periods may be difficult to remove. Early removal may decrease the risk of some complications, especially infection.